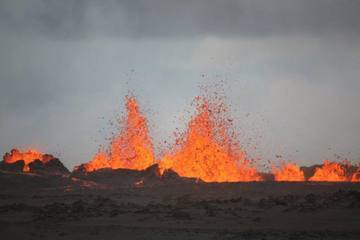 A new volcanic eruption in southeast Iceland on Sunday fountained lava nearly 200 feet into the air. Lava is spewing from the same crack as a small eruption that occurred Friday. The fissure slices through the 200-year-old Holuhraun lava field, between Bardarbunga volcano and Askja volcano. What do you share when you sign in with Facebook or Google? The eruption can be seen on live webcams here and here. Emergency officials briefly raised the aviation alert warning to red, but no commercial flights have been affected. The volcanic activity kicked off Aug. 16, when thousands of small earthquakes underneath the Bardarbunga volcano signaled fresh magma (molten rock) was burrowing underground. After a few days, the tremors showed the magma push off toward the northeast, forming a long channel called a dike. This narrow magma intrusion is now more than 28 miles long. On Aug. 29, the dike punched through to the surface in the Holuhraun lava field, an older lava flow that erupted in 1797. Lava briefly erupted just after midnight local time (8 p.m. ET) for three to four hours. A small amount of molten rock streamed from an old fissure some 2,000 feet long, jetting clouds of steam. The Holuhraun lava field sits at the toe of Dyngjujokull glacier, between Bardarbunga volcano and Askja volcano. Askja volcano is located 30 miles northeast of Bardarbunga. Fissures from earlier eruptions fractured the remote and rugged terrain. As the dike tunneled underground and neared the surface there, it shifted the ground, opening new cracks and widening older fractures, scientists with the University of Iceland reported. New cracks in the glacier covering Bardarbunga volcano also hint at unrest beneath the ice. Bardarbunga volcano is buried under an ice cap 1,310 to 1,970 feet thick. Three circular crevasses, described as ice cauldrons, were discovered in the ice cap during a reconnaissance flight Aug. 27, the Met Office said. Each pit is about 32 to 50 feet deep. The pits indicate either an eruption or geothermal heating that is melting ice deep below the glacier's surface, according to the Met Office. Scientists can only detect a subglacial eruption at Bardarbunga by watching for melting and "listening" for the seismic signals of lava melting ice.